Electric fridge / freezers have become the rage in the past decade. Thy are efficient, don’t require the regular purchase of ice, and will keep ice cream in its solid form in the heat of summer. However, the cold fact of the matter is that coming up with the $800 to $1,600 price tag may require sourcing a second job or selling your first born. Though I’ve had an ARB fridge / freezer strapped in my Toyota Tacoma for years, when out in my ’82 Hilux I use an old-school steel-belted Coleman ice chest (purchased in 1983 when I bought the truck). After 30 years and hundreds of trips through the American West and Mexico, the time came for my trusted old friend to retire. The dilemma I faced was whether to replace it with another standard cooler, or spend several hundred dollars and step up to an über-cooler. The questions that arose were whether the additional investment would be offset by a longer life span, would I gain functionality, and ultimately, would it keep my coldies cold for a greater period of time? Assuming that I was not alone in my quandry, I set forth to determine who makes the best ice chests, and would the benefits offset the additional investment. Are the handles easy to grip for a comfortable carry? Are they concealed within the basic form of the cooler or do they protrude from the sides? Is the footprint conducive to being packed efficiently with other square and rectangular items such as a toolbox, water jug, and storage bins? Are the interior walls vertical or tapered, and can you utilize all of the available volume? Is the flow controllable, or does it erupt like an angry volcano? Though each of these criteria is highly subjective, they were assessed and given a value. Is the unit injection molded or rotational molded? Is it fully insulated, and how thick are the walls and lid? Is the lid hinge built for a long, hard life (thousands of cycles) or just a season of weekends at the lake? Does it lock in the open position? Does it seal completely when closed and keep fluid from splashing out when bounced around or tipped over? Can it be padlocked closed? Is the floor tapered to allow for full drainage? Does it have tie-down hoops or grooves in the lid for lashing? All premium units in this review are produced using a procedure known as rotational molding, or rotomolding. The process involves filling a hollow mold with polyurethane (PE) granules and heating it while it is rotated around two perpendicular axes. As the granules melt, centrifugal force disperses the liquid PE evenly within the mold. In the case of coolers, which require insulation, foam PE is pressurized and injected into strategically located ports. With regard to standard coolers, most are injection molded (thinner wall thickness) and utilize air as an insulator. Some have insulated lids, but often include drink caddies, which are thin areas susceptible to thermal transfer. With the above criteria in mind, the units selected for this review were the Canyon Outfitters 35, Engel DeepBlue 35, Grizzly 40, Igloo Sports-man 40, Pelican Elite 35, and Yeti Tundra 45. All were in the 35- to 40-quart range and white in color, which absorbs the least solar energy. 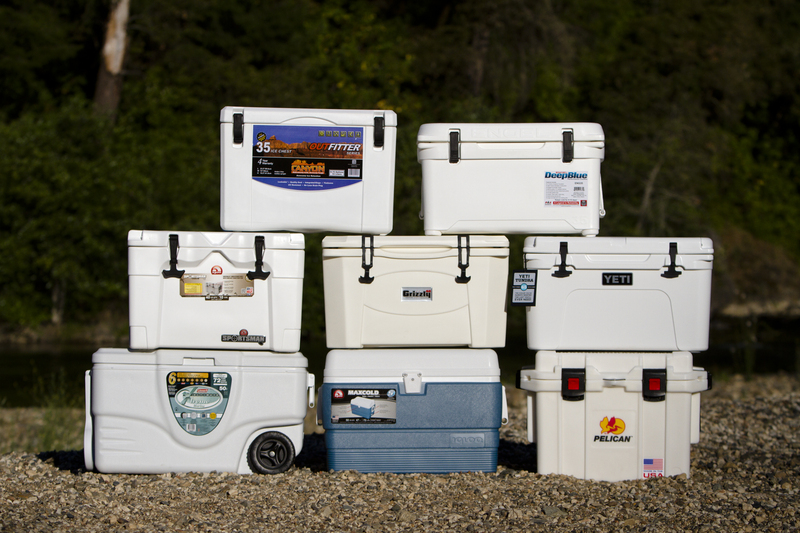 We included two standard units, the Coleman’s Xtreme Wheeled 50 and Igloo MaxCold 50 (available only in blue), to determine whether spending the extra cash on a rotomolded cooler is worth it. Though these do not have individual reviews, their performance results are in the conclusions and data chart. Real-world Scenario: Most manufacturers represented in this review boast that their coolers will retain ice for a certain number of days in a controlled environment. However, the conditions our equipment face in the backcountry are rarely “controlled.” We decided to subject them to a worst-case scenario, one that a cooler might experience while mounted on the rack of a Jeep. Temperatures during the test ranged from mid-’90s during the day to mid-’60s at night. All were placed on an east-facing deck and received direct sunlight until midday, then shade for the rest of the day. The average open time each day was approximately 8 minutes (simulating a twice-daily routine for access at meal times). 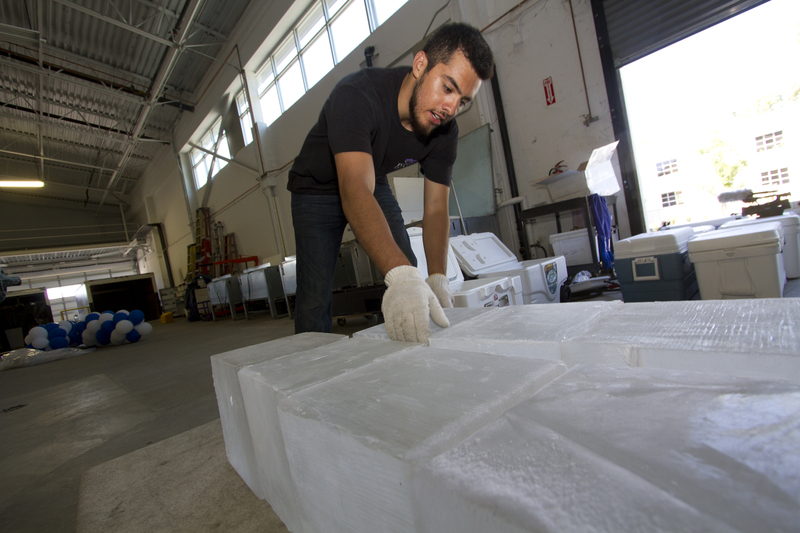 Ambient Temperature: Each unit received a solid block of clear ice (approximately 10 x 10 x10 inches, 33 pounds) procured from a local event planner—think ice sculpture quality—and a plastic storage bin containing six beers. 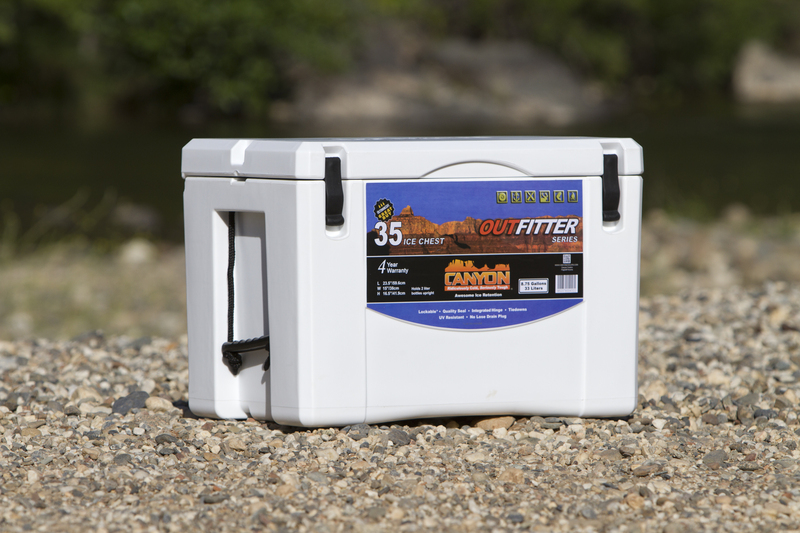 Though prechilling a cooler (river rafters freeze them prior to use) will add days to the life of your ice, most of us simply grab a chest from the garage, fill it, and go. Ambient temperature at the time of ice and beer insertion was 101°F; interior temperatures were 95°F. 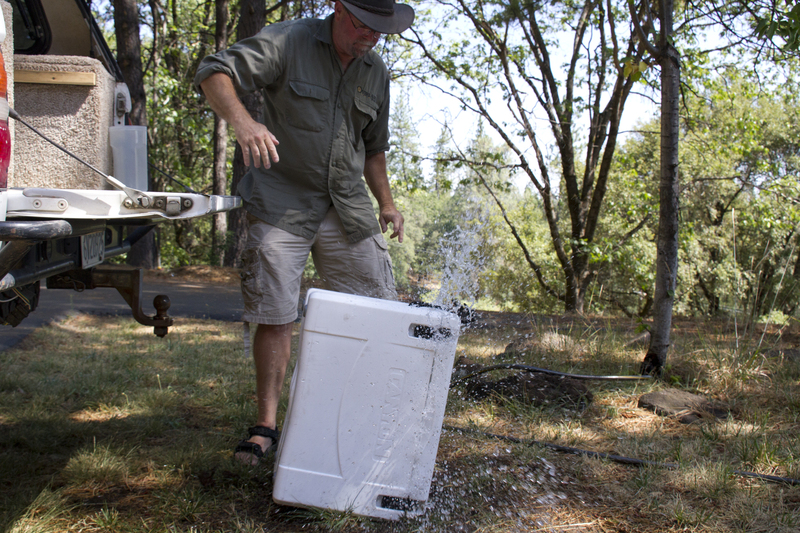 Though my modus operandi is to drain an ice chest frequently (two to three times a day) into a small “beverage” cooler— this keeps drinks cold and eliminates the need to introduce warm items to my ice— the manufacturers I talked with unanimously insisted that ice will last longer when the water is left in. Being the obedient product tester that I am, the water stayed. To mitigate end-of-day coldie cravings, each morning I exchanged the cold beers for six at ambient temperature. Ice Melt: Though many cooler tests evaluate how long a product retains ice, the exact amount used will inevitably vary. My focus would be on how fast it melted. Every 24 hours I drained the water, measured its volume, and poured it back in. To determine each unit’s ability to preserve perishables, temperature sensors were placed at the bottom of each bin as well as on the lid. When the ice melted to the point that the bins capsized, sensors were placed 1 inch above the water level. Readings were taken every 24 hours, as well as during exposure to direct sunlight and shaded afternoon conditions. Thermal Transfer: One of the things we learned during our sleeping bag comparison (Winter 2010) was that the transfer of thermal energy varies among seemingly similar materials and surfaces. 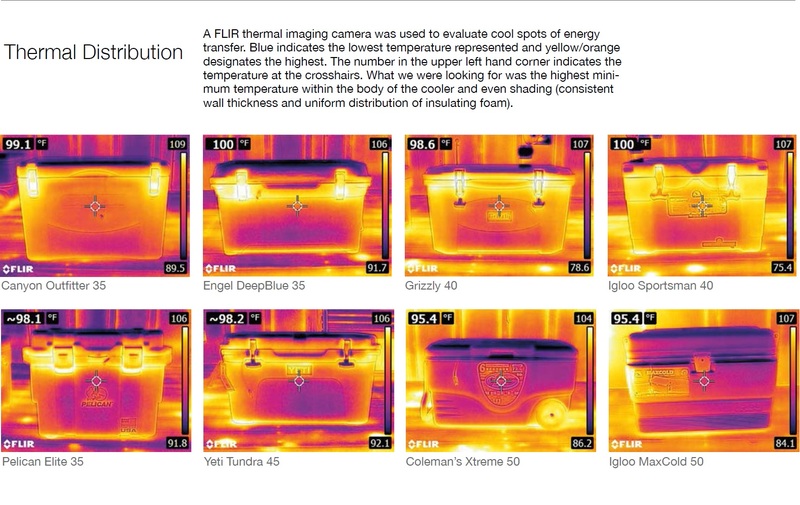 To assess “cold spots,” or areas of thermal transfer, we photographed each unit with a FLIR thermal imaging camera. Images were captured prior to the test as well as during times of direct sun, shade, and in the cool of late evening. You can see in the comparable images that areas near the lid seal and drain (blue tint) are susceptible to thermal loss. Uneven coloring (blue versus yellow/orange) in the body could be the result of irregular wall thickness or distribution of insulation. Drink holders, a big no-no when it comes to energy loss, present themselves as dark blue circles. Thermal imaging provided tangible evidence that drink holders (though handy) allow for considerable heat transfer (image on left). The same is true for areas near the lid and drain (right). Structural Integrity: I have witnessed more than a few coolers tossed off of Jeep racks or out of the back of a vehicle (including mine). The result in each case was a beer, bacon, and egg smoothie dispersed far and wide. To evaluate structural integrity, including that of the hinge system, latch, and seal, each unit was tipped, while still full of water, off the tailgate of my truck (about 3 feet). I will save you some grief by informing you that a standard, off-the-shelf cooler will self-destruct under this type of impact (sheered hinges and latches). Fortunately, Coleman and Igloo offer inexpensive replacement parts. Grizzly Bear Rated: The Interagency Grizzly Bear Committee (IGBC) issues a certification for ice chests that can withstand a thorough inspection by a hungry bear. Unfortunately, though I live in bear country, Yogi didn’t show up and renting a grizzly wasn’t in the cards. Ultimately, cooler selection comes down to personal needs and budget. 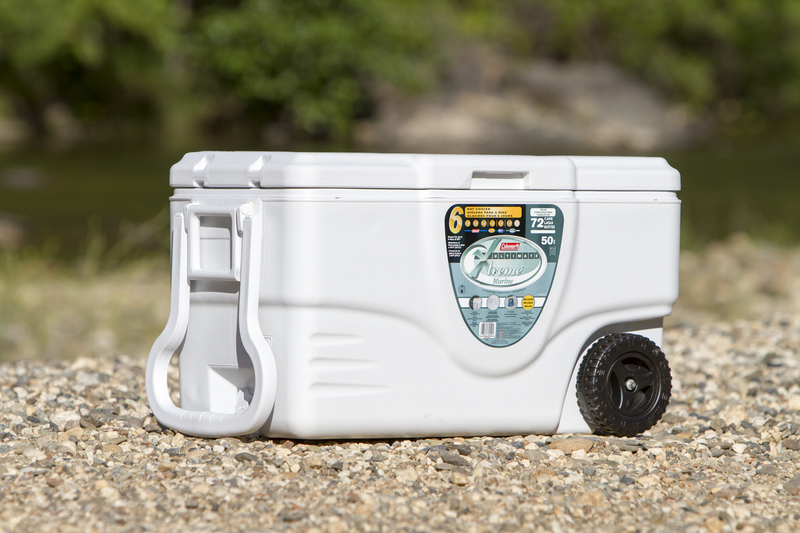 If your travels are limited to two or three days, a more economical cooler will work just fine while leaving some change in your pocket for fuel. 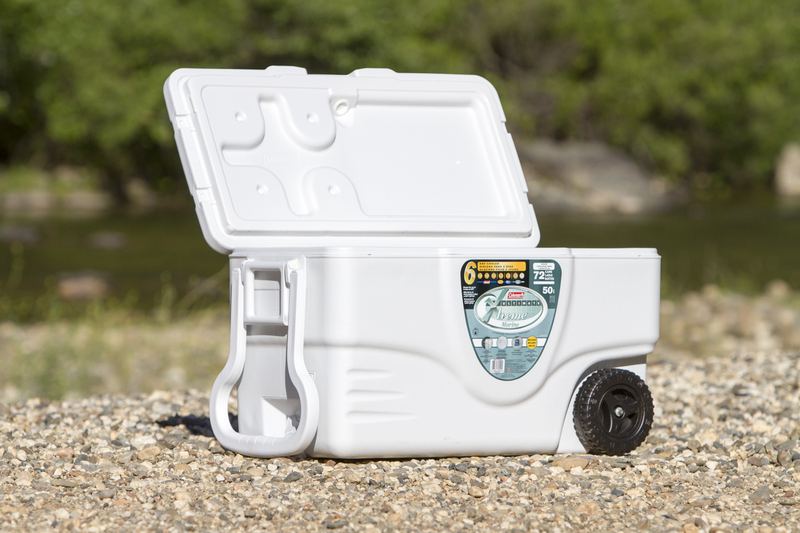 If your backcountry adventures extend to a week or more, or you want an ice chest you can hand down to your kids, the benefits of a rotomolded unit may offset the upfront cost. Canyon, one of the newer entrants to the cooler market, was launched by longtime industry insider Jason Costello and has acquired a respectable position in the arena. Their Outfitter 35, which is on the smaller side of their offerings, features rotomolded construction and clean lines. The hinge system is incorporated into the body and is secured with a stainless steel rod. Latches are a two-piece design formed from polyurethane and attached to the body with stainless steel hardware. 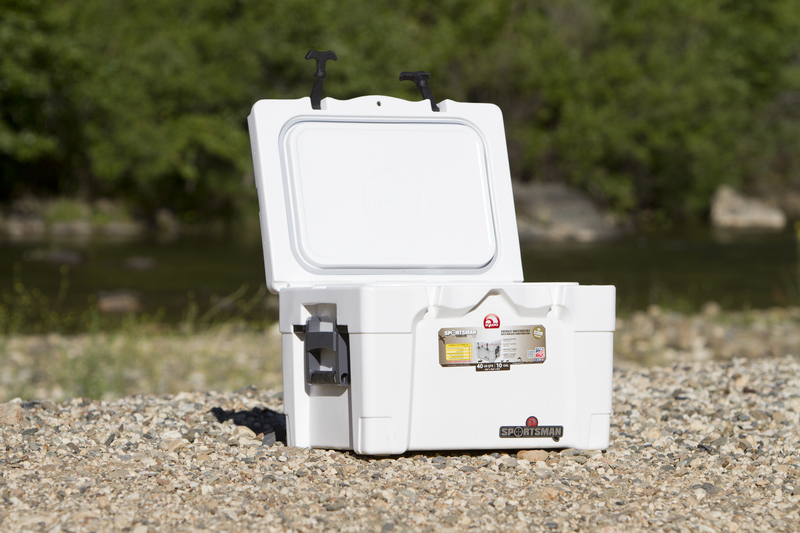 Two notches on the lid, which has a freezer-grade gasket, allow the unit to be cinched down securely with a strap. Canyon stated the tie-down/lock locations were placed strategically above the handles to eliminate warping under heavy loads. Carrying handles are molded into the body, easy to grip, and are accompanied by rope hoops on each end. The Outfitter performed well in field testing. Ice melt was second in-class behind the Yeti through the duration of the evaluation. The threaded drain plug, which has a built-in retainer to keep it from coming out, was fairly easy to control and dispersed water evenly and with minimal dribble to the bottom of the unit. When full of water and placed on its side, it displayed moderate leakage. It also survived the drop test with minimal hemorrhaging and no damage. Infrared imaging revealed limited areas of thermal transfer, save the drain plug area and sections of the lid. The unit weighs 22 pounds and features nonskid rubber feet at each corner. We are told that Canyon is working on getting this cooler IGCB certified, but as of this time it is not. Made in USA. Four-year warranty. (Since this review was published in Overland Journal the Canyon Outfitter 35 has been IGCB certified and now comes with a limited lifetime warranty). Engel, the undisputed granddaddy of the electric fridge/ freezer arena, jumped into the cooler market a few years back. One thing I liked about Engel’s advertising pitch is that they only claim it will hold ice for 8 to 10 days, rather than the misleading “up to 20 days” assertion made by others. This unit, which also has a rotomolded construction, has a full length integrated hinge and I-beam inserts in the lid for maximum weight bearing and durability. 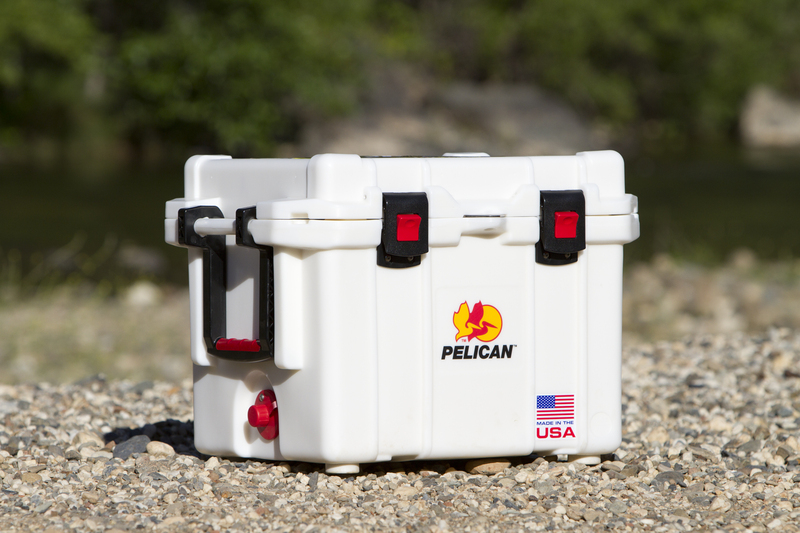 It is also one of the few coolers in the review that claims to be dry ice compatible (we did not test this). Dimensionally it is similar to conventional cooler designs: rounded corners and slightly wider and longer at the top. The interior walls are quite vertical, and the floor is sloped to allow for full drainage. The flush-mount latches are marine-grade quality and utilize stainless steel backing plates. I appreciated its dedicated tie-down points molded into the body as well as dual padlock tabs. Molded handholds at each end, along with wide, plastic-sleeved rope handles offer a comfortable carry. In field testing the DeepBlue 35 ran in the middle of the pack with regard to melt rates and interior temperatures. Leakage during the tip-over test was very light and among the best—a credit to its latching system and food-grade lid seal—and it took no issue with being dropped on its side from 3 feet. Thermal imaging revealed even insulating properties; the exception being areas of the lid where the I-beam supports clearly allowed for heat transfer—a price paid for the additional weight bearing properties. A plus on the Engel scoreboard is the variety of available accessories ranging from hanging baskets to vertical dividers. My only gripe with this cooler was the drain, which is diificult to remove without splashing water down and around the bottom. 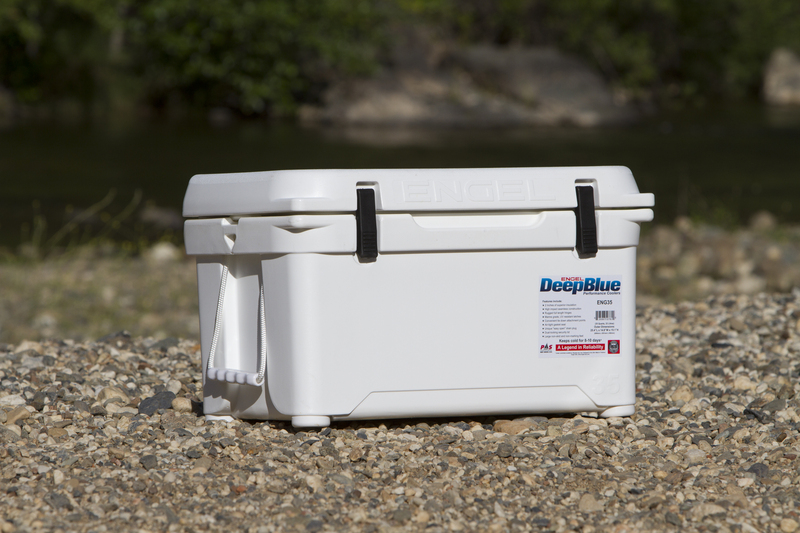 The DeepBlue 35 carries the IGBC Grizzly Bear certification and weighs 23 pounds. Made in Thailand. Three-year warranty. 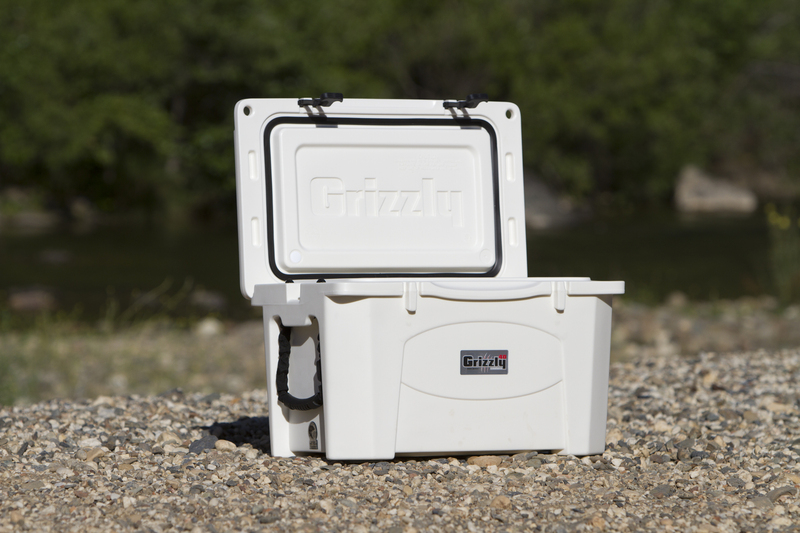 Grizzly Coolers, another recent arrival in the rotomolded premium cooler sector, has become popular with the hook and bullet crowd. Their 40-quart model is similar to the Engel in shape and design, yet varies in a number of features. 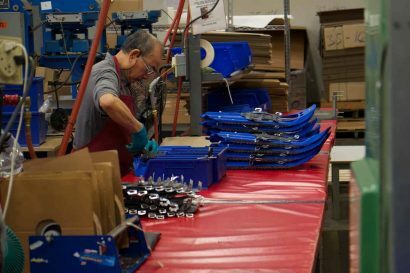 The latching system utilizes their BearClaw polyurethane T-handles (mounted to the lid rather than the base) that pull down and hook on molded tabs in the body. I like this feature, as it removes the mechanical aspect of a two-part latch. Corners are cut at 45-degree angles and the general shape has a slight taper toward the bottom. Molded handholds are notched at each end to accommodate a secondary rope handle. A full-length hinge is integrated into the body and secured with stainless steel hardware. I also like the 2-inch tie-down eyelets above the handle on each end, as well as padlock eyelets at the front corners. Ergonomically, this cooler works well. 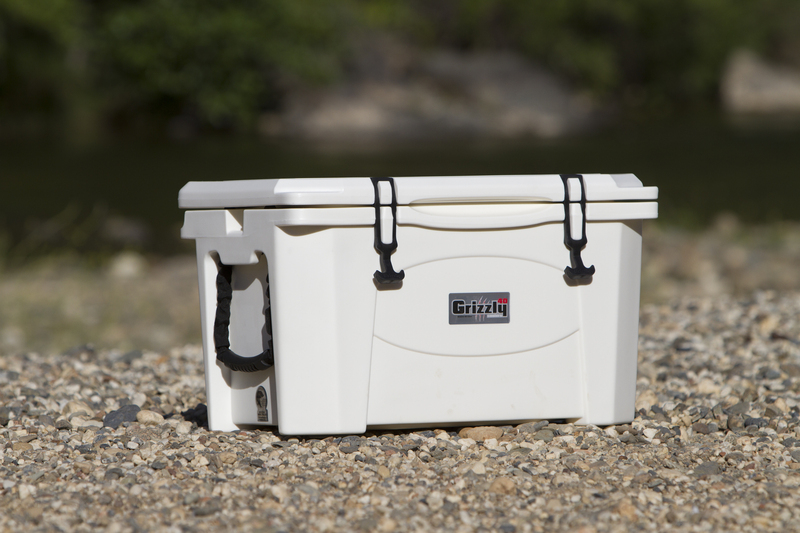 During fied use I found the 2-inch drain port, which Grizzly boasts as “quick draining,” to be all of that and more. Though it is large enough to drain a swimming pool, the over-sized molded threads are a bit difficult to break loose. It also created a fair amount of splash during removal (between the open and closed positions). The floor is flat, but has a center channel to allow for complete removal of contents. 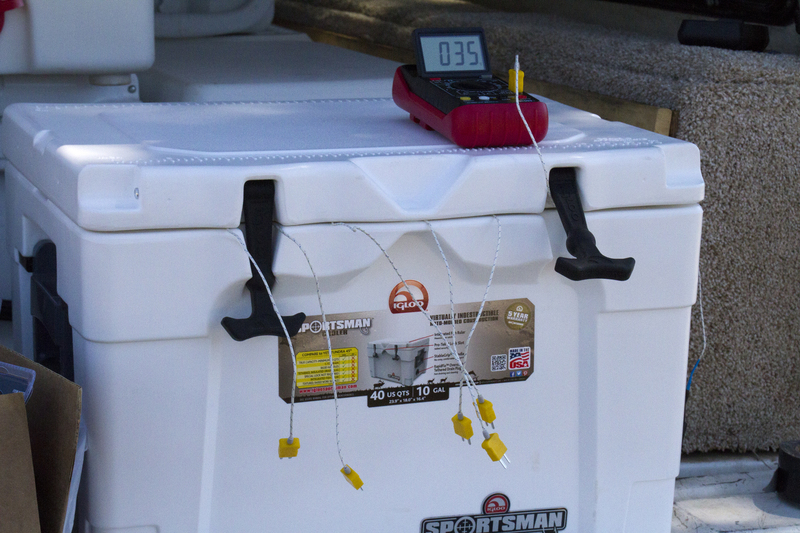 Interior temperatures were on par with other units, but melt rates came in slightly on the high side—equal to that of the Igloo Sportsman 40 and Pelican Elite 35. Infrared imaging showed even distribution of insulation and few cool spots. Tipping on its side resulted in moderate leakage and it survived the drop test without issue. 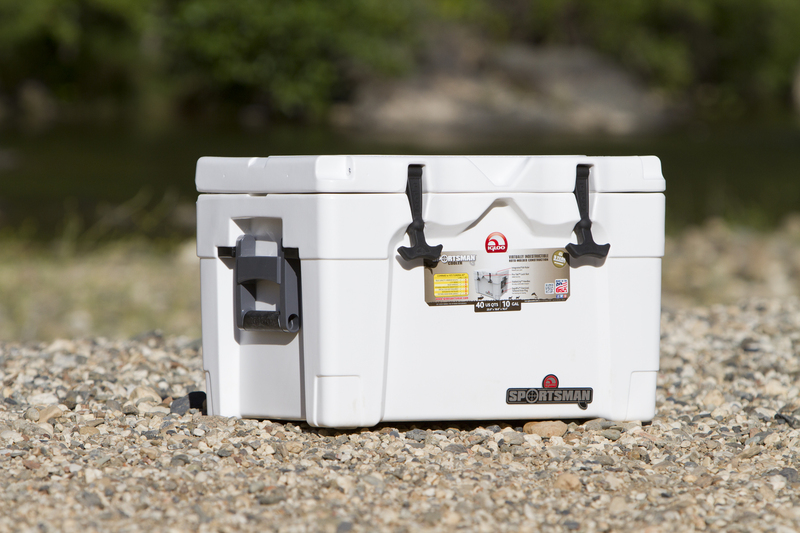 This cooler also carries the IGBC Bear Resistant certification. Made in USA. Limited lifetime warranty. Igloo followed conventional wisdom when designing the Sportsman 40, yet added a few twists of its own. The most evident is the deviation from molded carrying holds to more traditional injectionmolded plastic handles. They are well constructed, and when in the closed position are fully recessed into the body—a nice feature when packing next to other gear. Another unique aspect is a detent on the lid hinge that locks it in the open position. The rotomolded body has a single lock eyelet in the front, the lid features tie-down slots at each end, and nonskid rubber feet keep the unit from sliding around. One-piece rubberized T-Grip latches, fitted to the lid with corrosion-resistant aluminum rods, are fully recessed at the top, though the T-Grip handle does protrude slightly when closed. 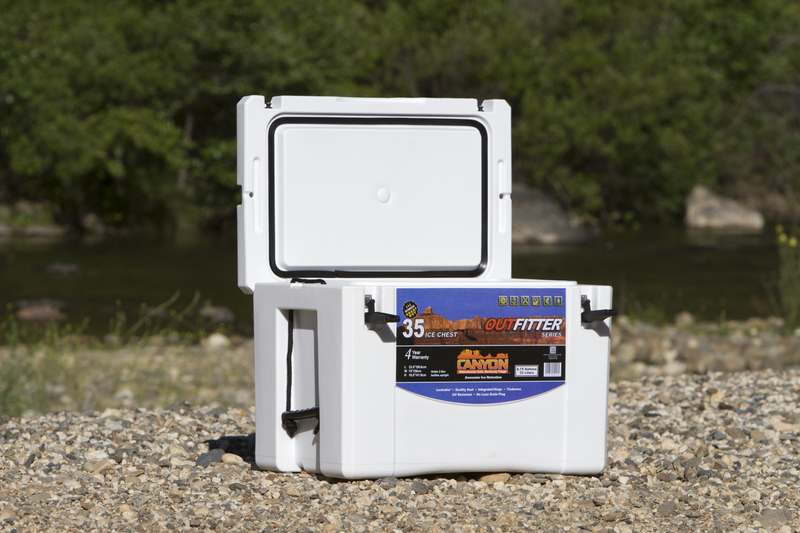 If you are a fisherman, the integrated scale on the lid might come in handy. Field testing resulted in melt rates on the higher end of the scale (but just slightly), and interior temperatures ran in the middle of the pack. Like the Grizzly 40, the Sportsman 40 has an oversized drain port (1.75 inch). Though it would vacate contents in a matter of seconds, removal was another wet and wild adventure. The tip-over test resulted in moderate leakage and it survived being dropped from 3 feet with flying colors. 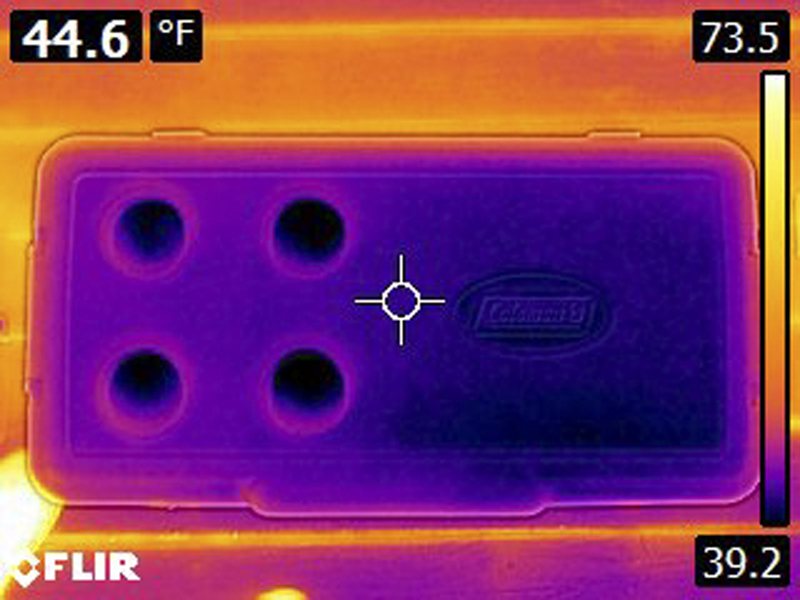 Thermal imaging revealed solid insulation throughout the body, save significant loss at their large drain port. Interestingly, the lid displayed slightly higher thermal transfer than other units in the review. Made in USA. One-year warranty. 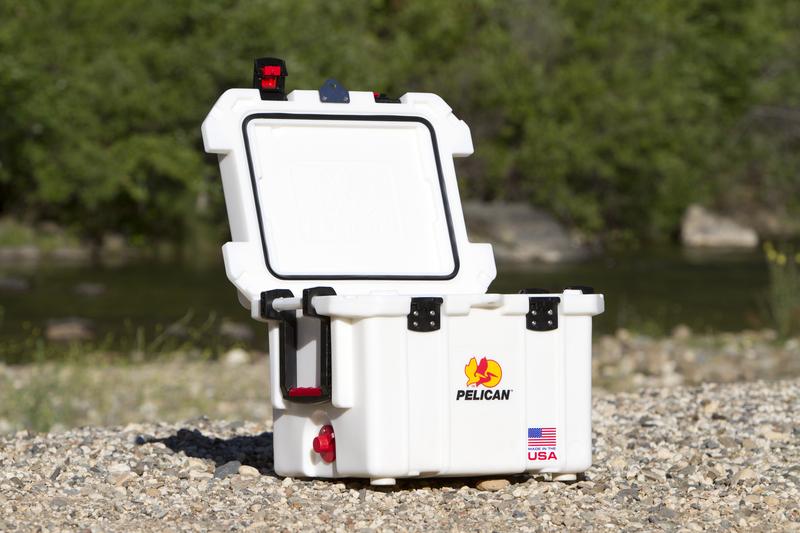 Pelican has been the go-to brand for high-quality waterproof cases for decades, and their entry into the rotomolded cooler sector was highly anticipated. Their Elite 35-quart model breaks from the traditional format in many ways. The most noticeable are its conventional latches and handles, and rather square stance. Latches are an injection molded, two-piece design with one-touch release mechanisms and stainless steel hardware. They function well, though they do protrude considerably from the overall footprint, as does the lock eyelet. Large swing-out plastic handles are attached to molded handholds on each end, and raised corners on the lid allow for ratcheting the unit down from the front or side. Nonskid rubber feet at each corner keep the Elite 35 from sliding around. Unfortunately, one was knocked out of its socket while pulling the cooler from my truck (an easy fix). 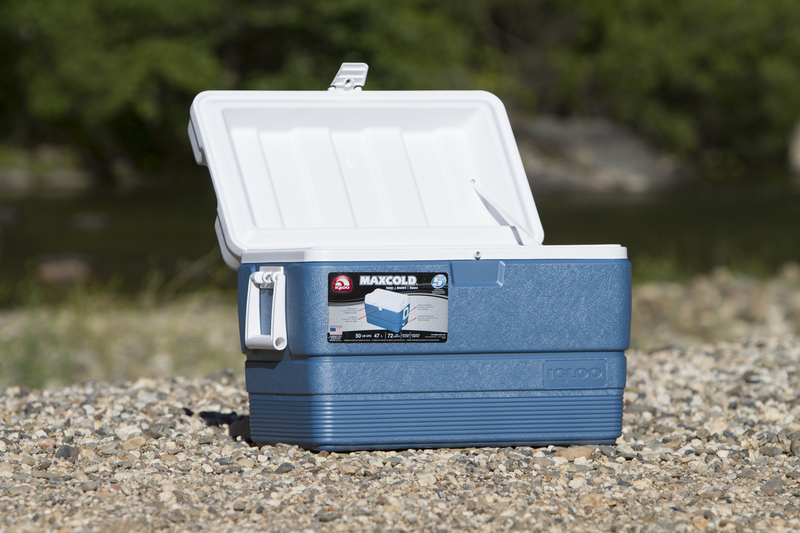 Though this cooler is built like a tank, it is significantly heavier than the other units in the review (32 pounds). Additionally, the outboard hinge system, handles, latches, and lock tab increase overall dimensions without increasing interior volume. Unthreading the recessed drain spout resulted in no splash or dribble, and was the most efficient in the group, though I do have some concern about the durability of the plastic tether. Melt rates ranged a bit on the higher side, but interior temperatures were lower than average. Leakage when tipped on its side was moderate, and I think I heard it laugh when I dropped it off the tailgate. 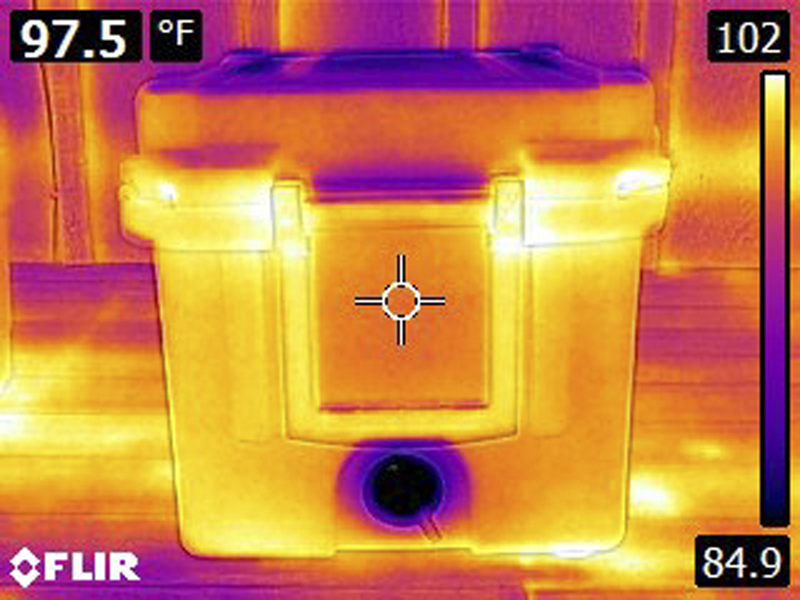 Infrared imaging showed thermal loss at the unit’s vertical depressions under the latches, as well as in areas of the lid. Made in USA. Lifetime warranty. 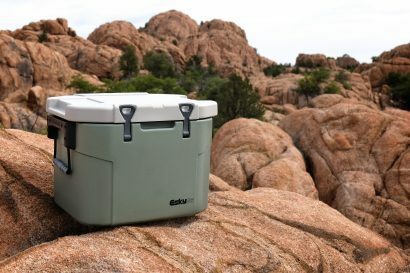 Yeti is no newcomer to the premium cooler genre, and they have spent the last decade perfecting rotomolded design and function—so much so that the products from other manufacturers may appear remarkably similar. The old adage, imitation is the best form of flattery, may hold true. The Tundra 45 follows family tradition with a clean, uncluttered form and radius corners throughout. It utilizes trucker-style rubber latches that hook into ball sockets on the body for a firm seal. Molded lock eyelets are found at the front corners and wide grooves on all sides allow for secure lashing. It has handholds molded into the body, as well as military-grade rope hoops with rubber grips. All hardware is stainless steel. 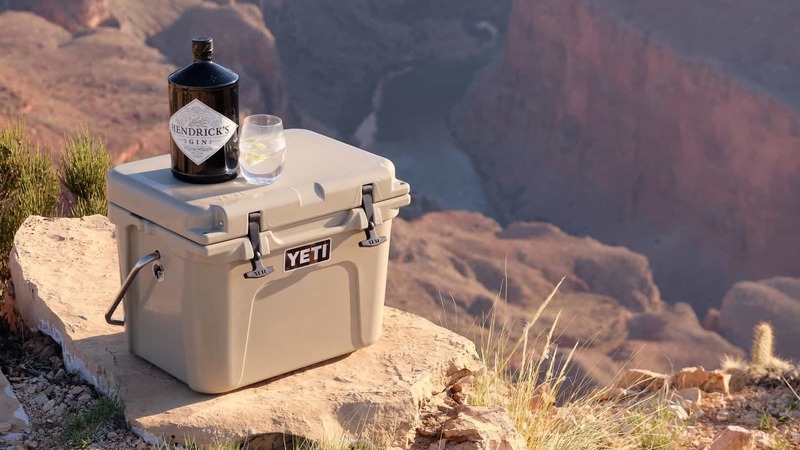 As with the other premium coolers in this review, the hinge is molded into the body and lid, which has a freezer-grade seal. 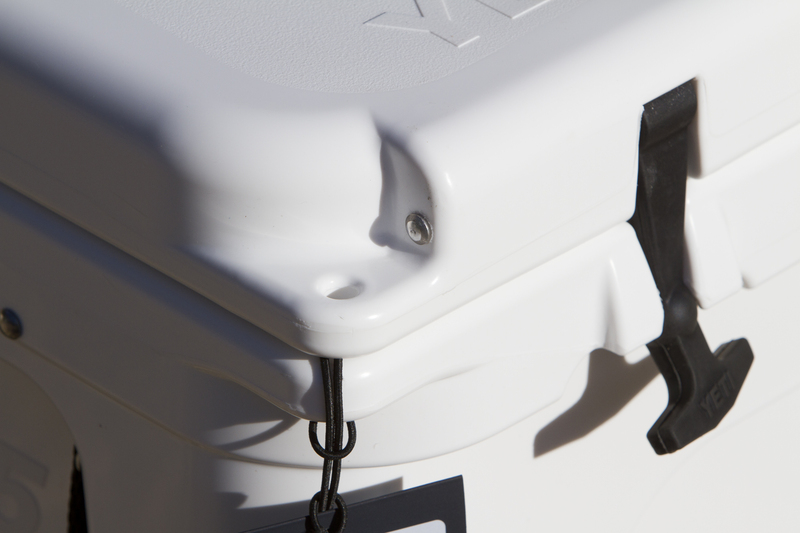 When it comes to accessories, Yeti offers an extensive lineup ranging from sliding feet and bear-proof locks, to a drain hose connector and hanging food baskets. 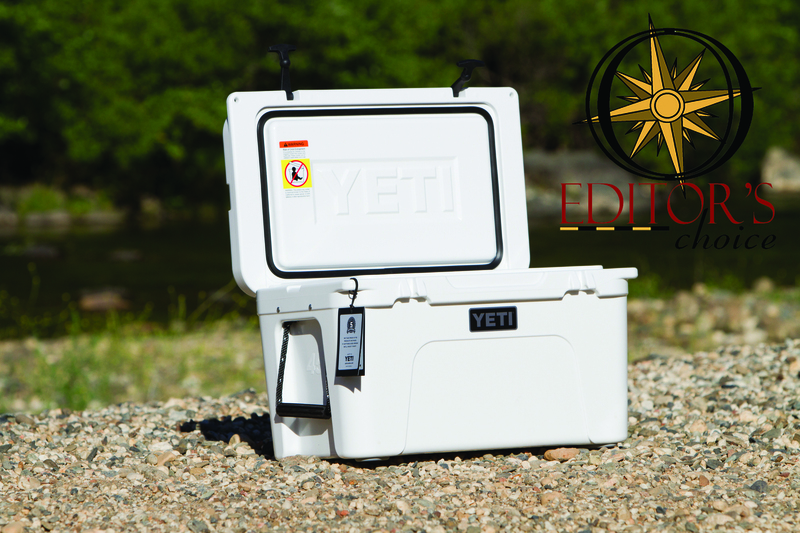 Yeti attributes the Tundra’s thermal properties to its injected permafrost insulation, which proved itself during the field testing. Throughout the six-day trial the Tundra displayed consistently lower melt rates than the rest of the entrants, and held ice an additional 18 hours over the next best contender. Interior temperatures also landed among the lowest in the group. The drop test inflicted no damage and there was only light leakage when turned on its side. Infrared imaging showed even distribution of thermal transfer and minimal cool spots. The vortex drain system did splash and dribble a bit, but it was less than all but the Pelican Elite and Canyon Outfitter. The one gripe I have is that the “45” designation is misleading, as true volume is only 35 quarts. 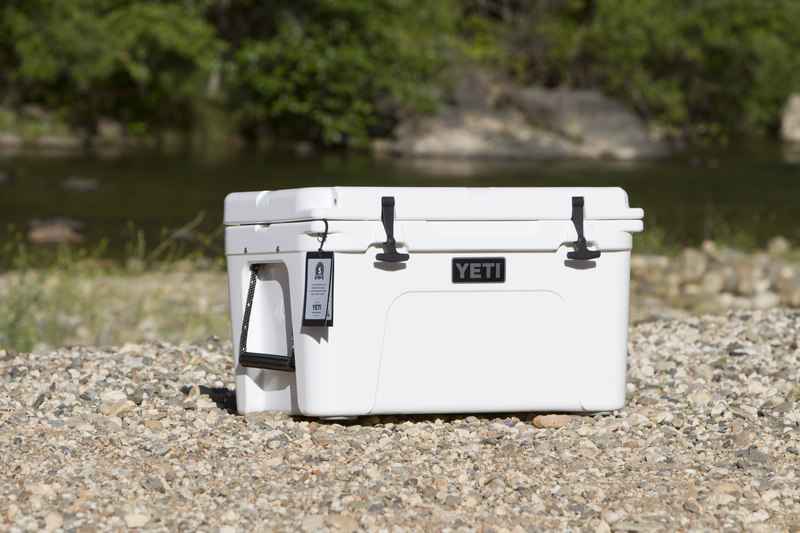 However, if I had to pick a cooler to take for the long haul, and price was not a factor, Yeti’s Tundra 45 would be the one. Made in the USA and the Philippines. IGBC Bear Resistant certified. Five-year warranty. To be fair, I will be the first to admit that each of these coolers would have performed better if I had adhered to the cardinal rules of keeping them out of direct sunlight and never introducing warm items to the ice. As for draining versus not draining the water, that may be fodder for a future test. 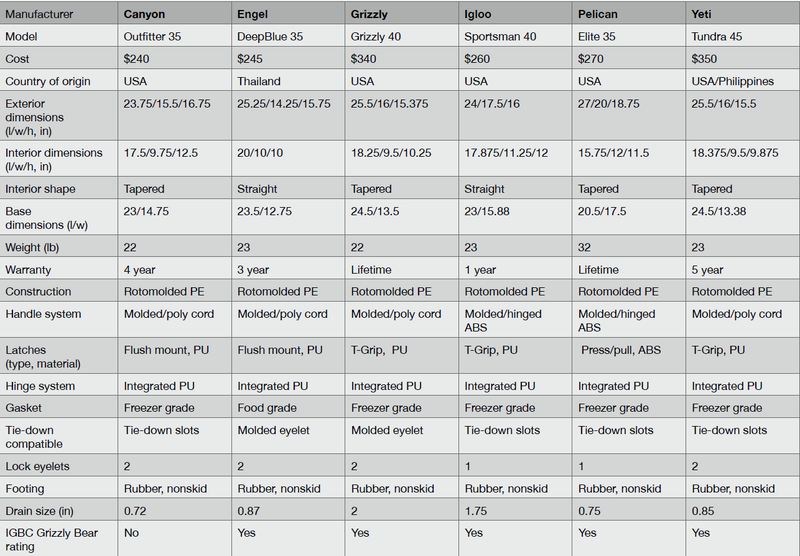 Regarding construction and durability, all premium units in this review are rotomolded, have full-length hinges, aluminum or stainless steel hardware, and freezer or food-grade seals. Though a latch, handle, or drain plug may need replacing at some time, in my opinion each of these coolers will withstand years of strenuous use. The Coleman Xtreme Wheeled 50 and Igloo MaxCold are much lighter duty, and care needs to be taken to preserve the life of hinges and latches. Notwithstanding price, ergonomics and physical form should play a major factor in selecting the ice chest that is right for you. 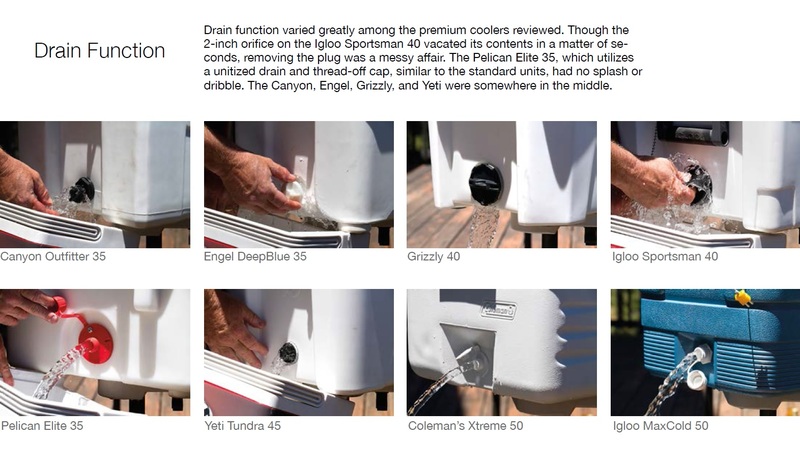 The Canyon Outfitter 35 and Igloo Sportsman 40 have nearly vertical lines and no protruding edges. The Yeti Tundra 45, Engel DeepBlue 35, and Grizzly 40 assume a more traditional tapered build, while Pelican’s Elite 35, with its boxy shape and robust padlock tab, latches, and handles outboard of the body, is in a class of its own. 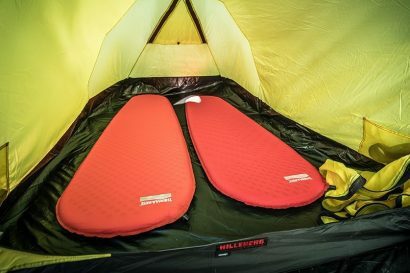 After using the simple, pressure-fit plug on my old Coleman for the past 30 years, I found large drain ports to be the Achilles heel of most units in this review. All but the Pelican, Coleman, and Igloo MaxCold splashed and/or dribbled fair amounts of water during draining. The Yeti and Engel were slightly better, the Grizzly in the middle, and the Igloo Sportsman was a true gusher. The tip-over exercise resulted in all coolers losing a bit of water, and performing this with the latches in the up position versus down (less hydraulic pressure against the latches) reduced loss significantly. All rotomolded units survived the drop test with minimal hemorrhaging and without damage. I should have avoided subjecting the standard Coleman and Igloo MaxCold to these tests, as the tip-over exercise sent a tsunami of water down my shorts, and the drop zone resulted in their lids blowing completely off the hinges. With regard to thermal properties and internal temperatures, I found that the slightest deviation in sensor location had a significant effect on the reading. For example, the difference between positioning the probe at the bottom of the plastic bin versus an inch above the water line could be as much as 4°F. Placing it on the bottom of the lid resulted in an 8- to 10-degree increase. All maintained food-safe levels until day four. The Engel, Igloo Sportsman, Canyon, and Pelican gave up the fight on day five. The lone survivor on day six was the Yeti, which yielded to the elements that morning. When the dust settled (or the ice melted), the Engel DeepBlue 35, with its IGBC certification, solid build, performance near the top of the pack, and $245 price tag edged out the Canyon Outfitter 35 to go home with the Value Award. The Yeti Tundra 45, which outranked all takers in nearly every subjective and objective evaluation, save the $350 sticker shock, receives my nod for Editor’s Choice. 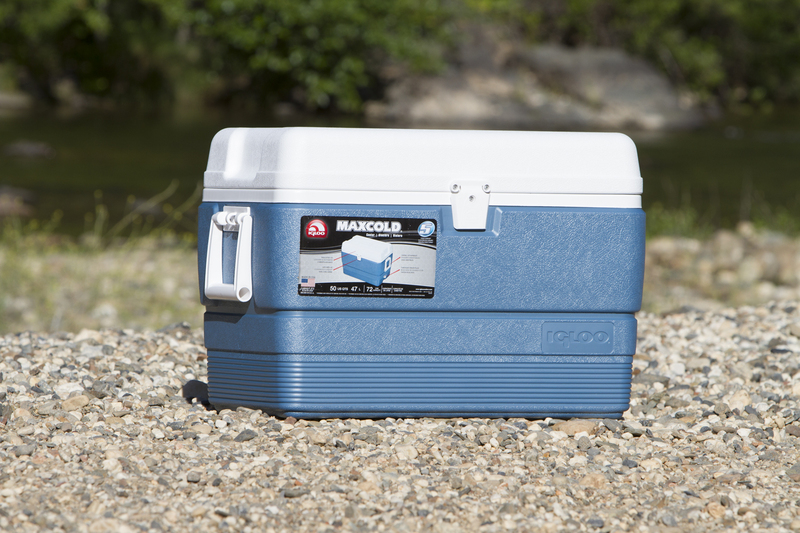 I found the Coleman Xtreme 50 and Igloo MaxCold 50 to be a good value, and perfectly capable of keeping you flush with coldies for an extended weekend trip. 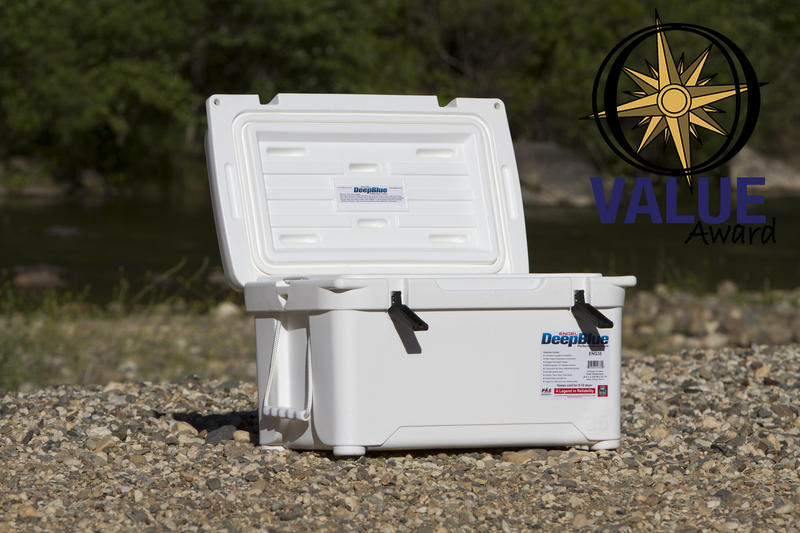 Though they are light weight and comes with a lower price tag than the rotomolded coolers, the tradoff will ultimately be shorter life span of ice, higher possibility of damage or lost content if dropped of tipped over, and the likelihood that you will at some time need to replace the hinges and or the drain cap. However, bearing in mind that they are about one third of the cost of a premium unit, we consider them to be a good value. This story first appeared in the Fall 2015 issue of Overland Journal.